The Dorset Park Community Garden had a great start to the gardening season this year! We started out by preparing our plots for planting, cleaning out debris that had accumulated during the winter and adding fresh soil where needed. Thanks to Christine Markwell for her donation to the community garden of an ample supply of seeds from the Food Bank. These included an assortment of flower, vegetable and herb seeds. The Dorset Park Community Garden has also been participating in a number of trips and educational workshops this spring. We partnered with Chester Le for a trip to a “Seedy Saturday” event in March. This was a successful event. Garden members picked up free seeds and other resources to help them to have a successful year in gardening. They also attended a workshop while there on sprouting and worm composting. Everyone found the trip to be informative. In April we partnered with Juan Sanchez and the city of Toronto for a series of workshops. These workshops were on gardening both indoor and outdoor. At these workshops residents learned which plants were good for cleaning the air inside our homes. We also learned an innovative way to start seedlings inside and then transfer them outside by using recyclable water bottles. The bottles were cut in half and a hole made in the cap of the bottle; a cotton strip was then placed in the hole, soil and seeds were then added to the top half and water to the bottom. The container was then placed where it would get a lot of light. From the workshops we had residents who were interested in doing gardening and having a plot of their own to plant vegetables and herbs. We added four new members to our Community Garden Group. In May a group of us undertook a trip to Rexdale Foodie Festival. It took us about two hours by TTC to get there. Though the trip was long, we enjoyed spending time talking and socializing with each other on the way. It was well worth the trip! There were cooking demos, zumba exercises, arts and crafts, good food and great music! Some of also planted seeds in small flower pots and were able to take these home. A good time was had by all! June came and we had three successful events. The first one was at Dorset Park Day where the Community Garden set up a display showcasing past events and did a demonstration. The demonstration was showing Dorset Park residents how to garden using diapers as a medium to maintain moisture in potted plants. The interest was high and people were intrigued as to how it would work. We took clean diapers filled them with water till they were saturated; cut them open and took the insides (hydra-gel) and mixed one part diaper mix and one part soil. To this was added more water, and put in a flower pot to which we added seeds. Participants were fascinated with the procedure and liked getting involved. They were then able to take home the finished product. The second event was a tour of Bendale BTI (Business Technical Institute). We were given a tour of their aquaponics system and their gardens. Greg Morrell, a teacher at the school, gave an excellent and informative tour of the facilities. There we learned how they were growing plants without the use of soil, and using fish poop as fertilizer for the plants. After the tour, Greg graciously offered the group some plants to take home. Our third event was a strawberry picking trip to Whittamore’s Farm. The response was over whelming and a waiting list had to be created. The bus filled up on the first day of registration. The invitation was opened up not only to the Garden group, but to the community. Special thanks to Molly Barnes, CAS, for providing the funding for the bus. 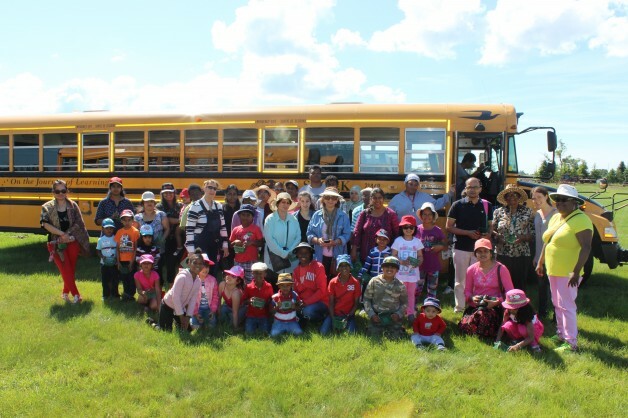 Families were delighted to give their children the experience of going to the farm to pick strawberries. After picking and sampling (smile) the berries, the group had a picnic lunch beside the bus. The children had a lot of fun playing tag, blowing bubbles and just running around. The adults talked and socialized, as they kept an eye on the children. It was a great time for everyone and something we would like to experience again. To gauge the success of our trip, people were given a short survey to complete. From the information gathered we surmised that Dorset Park residents would like to see more of the same: pick your own trips, picnics and socializing with one another. As a footnote, we had a senior on the trip from another country who has lived here in Canada for years and always thought that strawberries grew on trees. She laughed as she shared this with a couple of us. Upcoming Events: How to make Strawberry Freezer Jam, apple picking and harvest party.